Everyone knows that breakfast is a very important meal and that we should all have at least a little something in the morning to start our days. However, there are still people out there who go without breakfast. And you know what? It makes me sad. I LOVE breakfast! You'll never find me skipping a meal in the morning (maybe partially because I know that skipping a meal would make me cranky and I don't wish that upon anyone who's around me? ;)). But honestly, we have all heard about the benefits of eating breakfast, and everyone should be doing it. No excuses!! And when breakfast can be easy and healthy, how can you not want to eat it?! A great example of a simple, yet healthy, homemade breakfast is these peanut butter banana oatmeal squares. I saw these bars on Pinterest, so I saved the recipe with the hopes of making them in the future. And I did! It's rare that a recipe I've pinned actually comes to fruition, so it's exciting when one does. This recipe is from an excellent blog that you should definitely check out - Gingerbread Bagels. 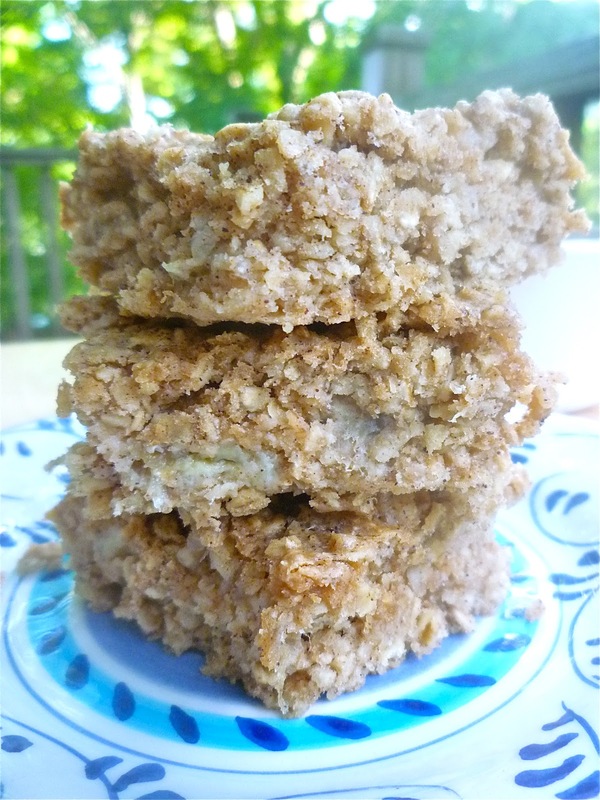 And the recipe for these delicious homemade peanut butter banana oatmeal squares is below! Mix together the quick oats, brown sugar, baking powder, salt, and cinnamon. Add in the vanilla extract, milk, and egg. Mix the ingredients together. Add in the mashed banana and peanut butter, and combine all of the ingredients. Pour the mixture into a lightly greased 8 x 8 baking pan. Bake at 350 degrees for 20 minutes. Cool and cut into squares. A couple quick points... I think just about any milk would work okay here. I happened to use vanilla soy milk when I made them, simply because that's what I had on hand. 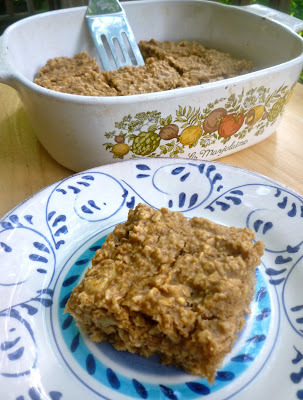 Also, I added roughly 1/4 cup more quick oats (so 1 and 3/4 cups total) than the recipe called for. I love that all the ingredients can easily be mixed in just one bowl in about three minutes flat. That's my kind of recipe!! I really loved these bars! 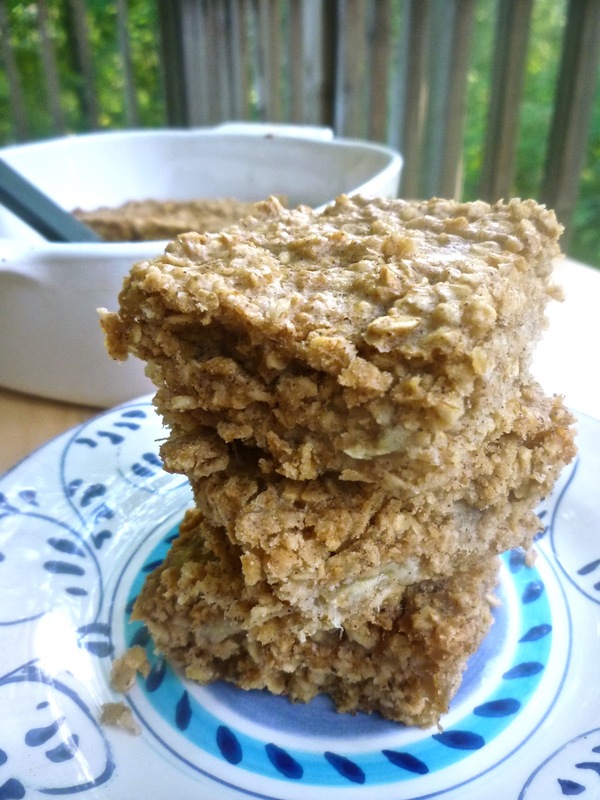 I could easily see these becoming a staple breakfast or snack bar to make fairly often and have on hand, either for breakfast or an easy, mid-day on-the-go snack. It's always a good idea to have healthy and easy options on hand!! If you're a huge peanut butter and banana fan like I am, you'll definitely want to give this recipe a shot. And you could also eat them as a dessert. They're pretty much a "no guilt" dessert option!